I’ve been meaning to seek out Maeve Brennnan’s short stories for quite some time now but somehow haven’t got around to it. This was just the nudge I needed, Jacqui. ‘Understated’ is right up my alley.Thanks! Cool. I think you’ll like her stories, Susan. There’s a real depth of emotion and insight in these stories, but they never feel too heavy-handed or overwrought. Subtlety and nuance are the watchwords of the day here. Lovely review, Jacqui. I also struggle with short stories, for a range of reasons, though the best are as rich as any novel. This sounds like an excellent collection and, despite your reservations, you’ve represented it beautifully. Thanks, Belinda. Short stories are never terribly easy to write about without descending into platitudes, so I’m glad you feel I’ve been able to convey a sense of the collection here! I think it helps that the majority of the individual stories (certainly those in the Bagots and Derdons sections) have a cumulative effect, each one adding another layer or element to our understanding of the relationships at play. So, in that sense, they do feel quite novelistic in style. Great review, Jacqui! I loved this book so much. And I agree with you: there is a strong sense of disconnection throughout these stories. Her writing is so beautiful, so melancholy. Ah, lovely to hear that you’re a fan of these stories too – that’s great. I completely agree with you about the writing. On the surface, it seems quite simple and beautifully precise, and yet the emotions Brennan manages to capture run so deep. All these individuals desperately isolated in their marriages…melancholic indeed. It can be difficult to write about short story collections. I tend to just focus on single stories and write about them. These sound very good. Based upon your commentary, It seems liken there is a pattern in that the stories take place during difficult times for the characters when past times were happier. Such situations often make for very good but sad stories. Yes, that’s it exactly, Brian. As each series of stories unfolds, we get a sense of the early stages of these relationships, of times of hope and happiness. Naturally, this is accompanied by various insights into the causes of fault lines, the things that have led to the terrible sense of dislocation that characterises these couples’ current situations. It’s all rather sad but beautifully done. I feel your pain! Brennan’s been on my horizon for decades now and I’ve still never quite managed to pick up one of her books. The eloquence of your review persuades me I should get my Brennan act together . . . Better late than never, as they say! Her New Yorker pieces sound excellent too, wry observations on the nature of New York life. I think they’ve been collected together in another of her books, The Long-Winded Lady. Fascinating reading, no doubt! I would have read her ages ago but the book I ordered once never arrived, A the same time I also ordered a biography as I’ve heard her life was just as tragic as her stories and it helped to know more. The biography did arrive but I never got around to it. The stories do sound very good but bleak. I agree with you, it’s not so easy to review short story collections. I only read a couple this year but didn’t review any. Oh, no! That’s a shame about the missing book. Still, you have her biography to look forward to. There’s a little section about her life in the introduction to this collection – just a few pages but insightful nonetheless, particularly regarding her working relationship with William Maxwell. I get the sense that she was razor-sharp, funny and a little bit tragic too. Now I remember how I discovered her and that I need to read Maxwell again. He is one of the most astonishing discoveries I made thanks to blogging. I haven’t read nearly enough of him, only ‘So Long, See You Tomorrow’ which I liked a lot. He was Brennan’s editor at The New Yorker, I think. It must have been a fascinating time to be there. Not a writer that was on my radar but I like the sound of ‘very bleak’ and ‘jet-black humour’ – just my thing! Makes me wonder what her ‘Christmas Eve’ stories contain! So glad you enjoyed this Jacqui. I love Maeve Brennan and can recommend The Rose Garden. I’ve yet to read this one but am looking forward to it. Thanks, Cathy. I loved these stories, full of the failings and frailty of human nature. It’s a shame they aren’t better known. I’m sure you’ll enjoy them too. 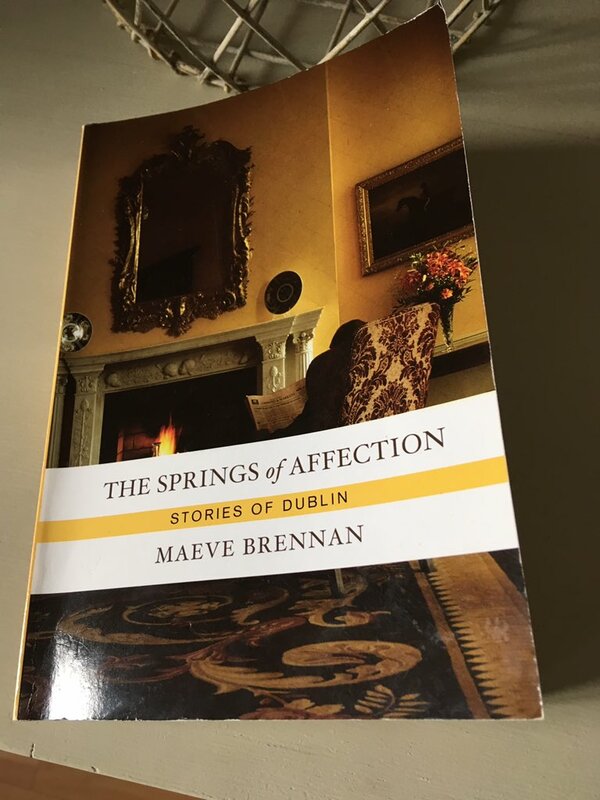 Check out this post featuring the book The Springs of Affection by Maeve Brennan from Jacqui Wine’s blog. Thanks for sharing my post Don Massenzio, much appreciated. This isn’t a writer I had heard of before. But these stories sound right up my street. I love stories that are linked in someway. Great review. She’s been on my radar for a while – partly on account of her association with The New Yorker – but this is the first chance I’ve had to read some of her work. It’s such a good collection, building in terms of insight into the characters with every story. I seem to have been on a run of bleak but beautifully written fiction lately, so it’s high time I read something cosy and witty! A very interesting long article and review of Maeve Brennan’s life and work by Joanne O’Leary in the September edition of the London Review of Books. You can see it online. I won’t put a link because they often don’t work, but it’s available if you want to read it. She was something of a fatal woman. This sounds so good, Jacqui! I do happen to have this collection of short stories, so another one to bump up the TBR pile. I had read her novella The Visitor some years ago and remember being very impressed. It prompted me to subsequently purchase The Springs of Affection. Oh, that’s great. Definitely something to look forward to there, although you might need to have something cheerful lined up as a follow-on read just for a change of tone! I’m glad to hear that you liked The Visitor – it does sound very good. I’ve never read Maeve Brennan and you’ve shown what an oversight this is. I love the rhythm in the quotes you’ve pulled – just stunning. That’s such a great point about the rhythm of her prose – it’s so beautiful, almost as though it’s been created to be read aloud! I think you’d like Ms Brennan, madame bibi. Cathy (over at 746Books) has been championing her for a while, so I’m glad I finally got around to pulling this from the shelves. I hadn’t heard of this author, so now I’m off to take a look. I’ve just read her biography by Angela Bourke and it is fascinating to see how much her early life in Ireland influenced these stories. Such a wonderful writer. Lovely review Jacqui. Oh, I’ll be very interested to hear more about that. The autobiographical pieces at the beginning of this collection are beautifully observed – very moving too, in a quiet, gentle way. Excellent review! I also find short story collections to be difficult to access, but this sounds like it’s been well edited. A character-driven, understated style happens to be my favorite form of short fiction, so I’ll be sure to keep this in mind for later in the month. Thank you. Yes, I think it holds together very well as a collection with the setting of the terraced house in Ranelagh acting as a kind of unifying thread. The extended focus on the Derdons and the Bagots also gives it a real sense of depth, so you end up feeling you know these couples quite intimately by the end of the book.